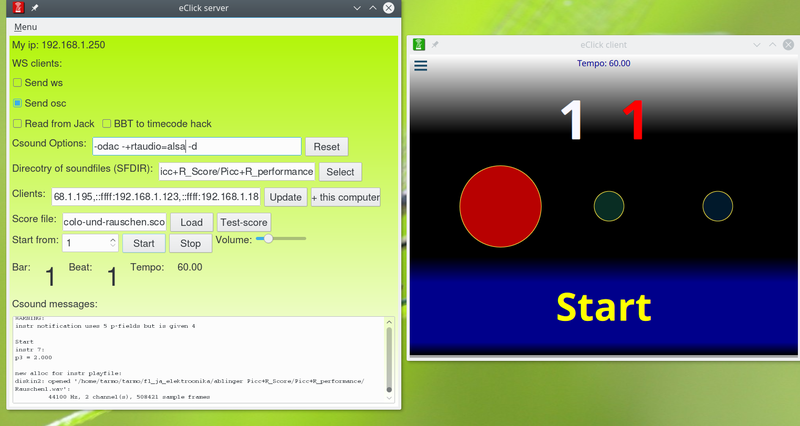 The first "production" release, vClick 1.0.0 is ready! vClick is a free wireless visual click-track system for musicians. NB! eClck has been renamed to vClick!! (due to possible trademark problems). Version 0.3.0 is out with multi-channel support (different signals to different players), very soon the first non-beta version with documentation. Please download, try out and let know how it goes! After lots of work, feedback from users, numerous improvements and changes in code eClick version 0.2.0 is out and ready for downloads. eClick is a free wireless visual click-track system for musicians. eClick first public release is out! eClick is a free wireless click-track system for musicians.